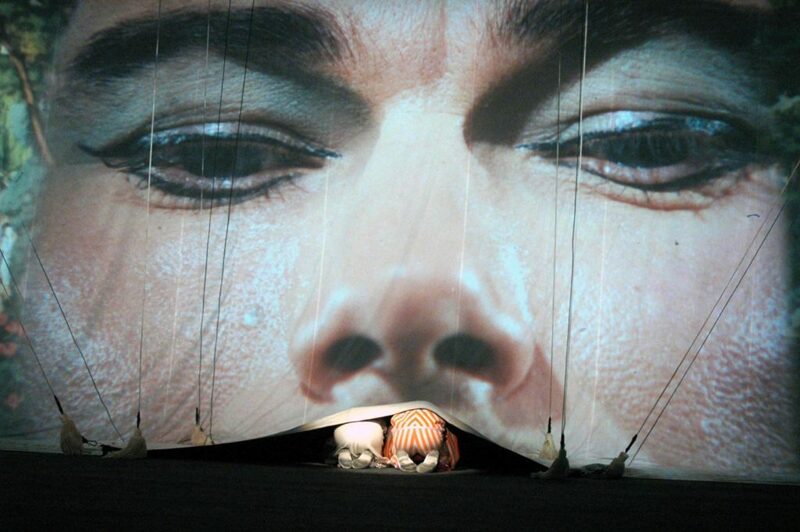 The circus-theme is by film director Evald Schorm. 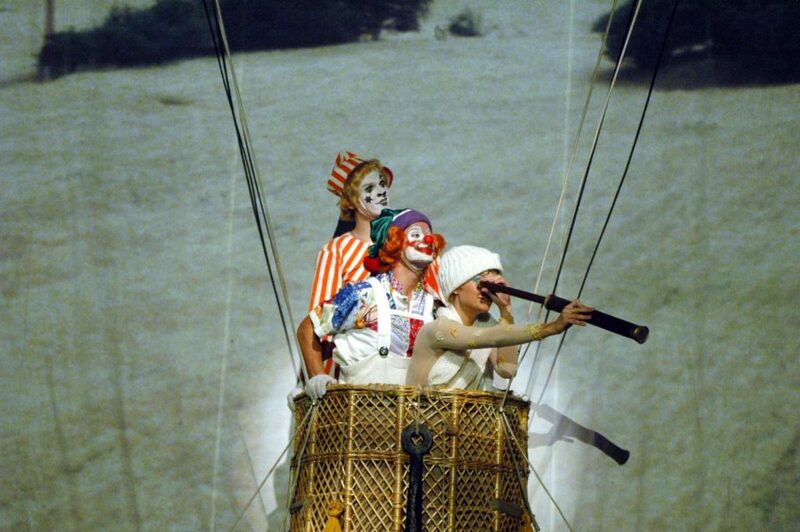 He directed the piece together with Jiří Srnec and Jan Švankmajer; the sets are by Josef Svoboda and Zdenek Seydl designed the costumes. Emil Sirotek, a cameraman, filmed the videos; script, choreography and music were generated by a team of five. We’re in a circus. Half of the arena lies behind a white curtain, whose corners are lifted to reveal a folding ladder (to be used later as a vehicle for the clowns), a huge cylindrical drum, a cello, a neon green trumpet (which will play a lonely melody), and an enormous red rose that periodically dances and twirls in the air. 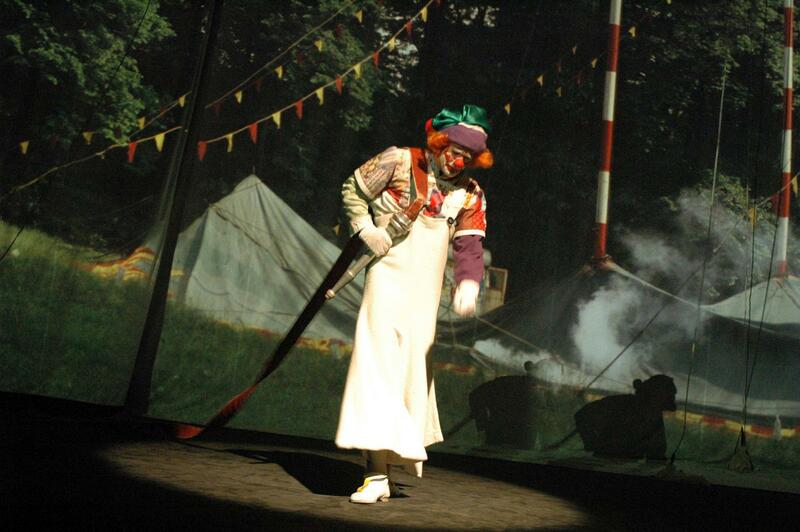 Viktor Svidró, sleek and top-hatted, is the circus director. His playground is the circus ring, which is complemented by a slew of locations shown on a panoramic, semicircle movie screen in the background. 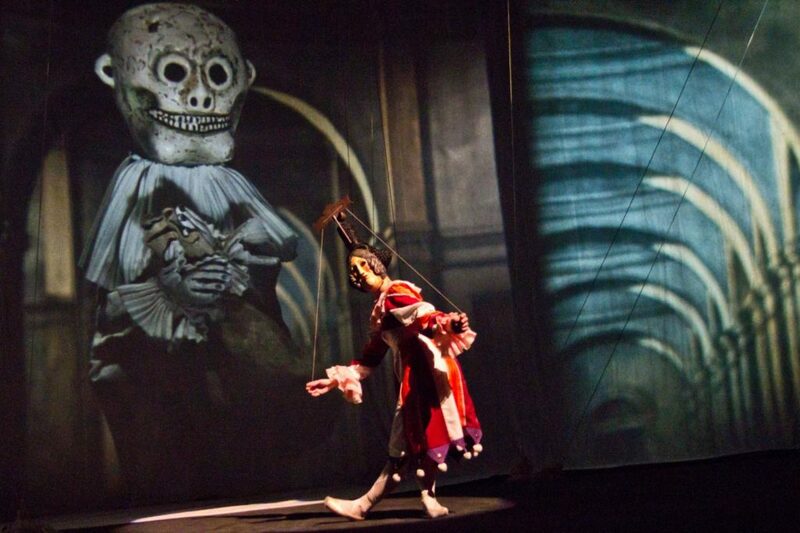 Onstage activity and video action blend seamlessly into an often surrealistic whole. The program leaflet calls Svidró’s role “the seducer”: he lures us, surely, but into what? – The world? The craziness of life? 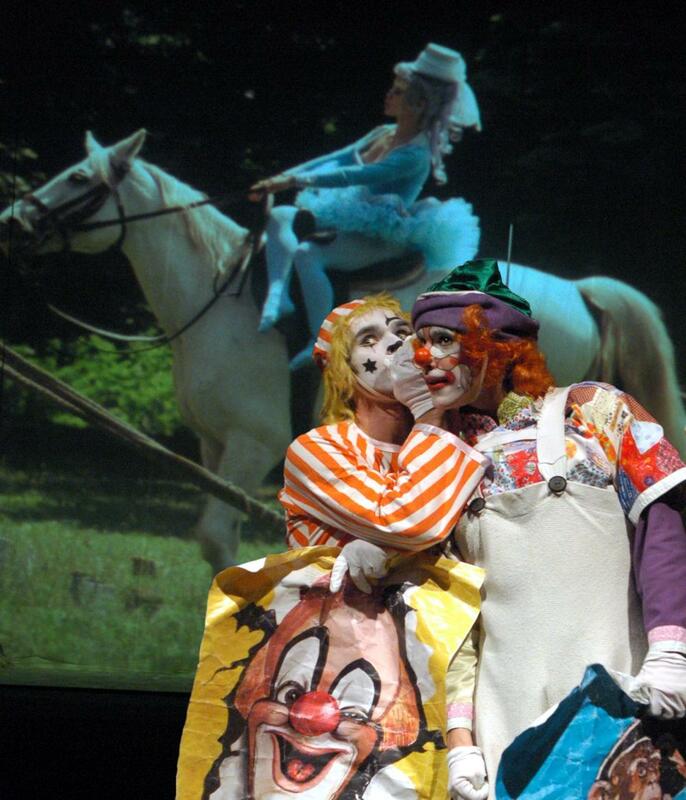 A circus can’t exist without clowns. Ours hatch from jumbo-sized eggs floating on a mountain lake. 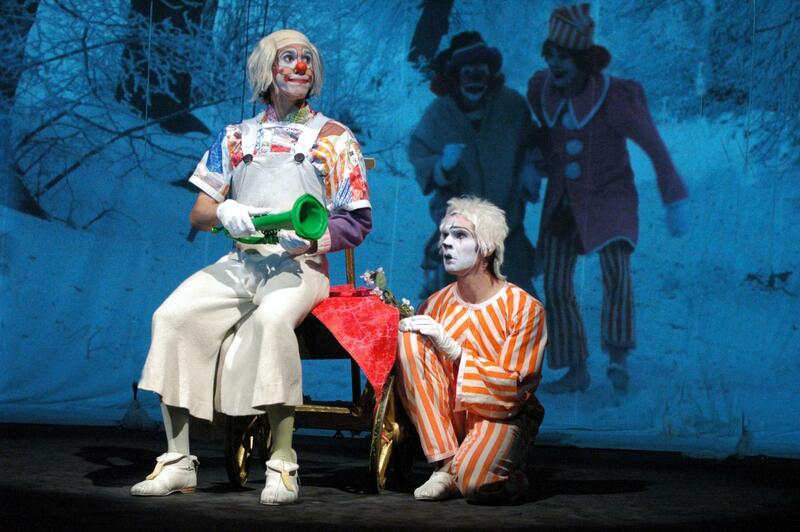 One clown is sad (Libor Kettner) and one clown is cheerful (Pavel Bilík). The scenery looks Nordic, and so the water is certainly chilly – and maybe that is why the pair pedals intently until tumbling into the circus arena. From then on, both clowns stumble accidentally from one adventure to another, sliding into absurd situations out of sheer insouciance. A Botticelli-like Venus (Eliška Kolářová), who emerged from similar icy waters, is the clowns’ most prominent lure. They chase after her like foxes on the hunt. She lures the clowns into the forest, flying with them across the treetops (and, strangely, over a close-up of fern field) in a hot-air balloon. She disappears – and then returns at the right moment to reinvigorate their hunt. Again and again she transforms into other muses: a fiery temptress, for example, or a butterfly-lady who revealed to be a circus ballerina. This ballerina and her dancing chorus join the Lipizzaner horses in a circus act that makes the women in the video sway blissfully (I wish I could have stopped the video for a moment to look closely at these dotty figures). The whirring whiplashes of Svidró’s seducer command both the muses and a pride of snarling lions. Fortunately, a protective safety net was lowered around the arena but unfortunately, the big top soon caught fire as a result of the fire-eater’s negligence. The two clowns bravely pumped water to put out the blaze (my neighbor got sprinkled), but to no avail: the circus was a pile of ash. 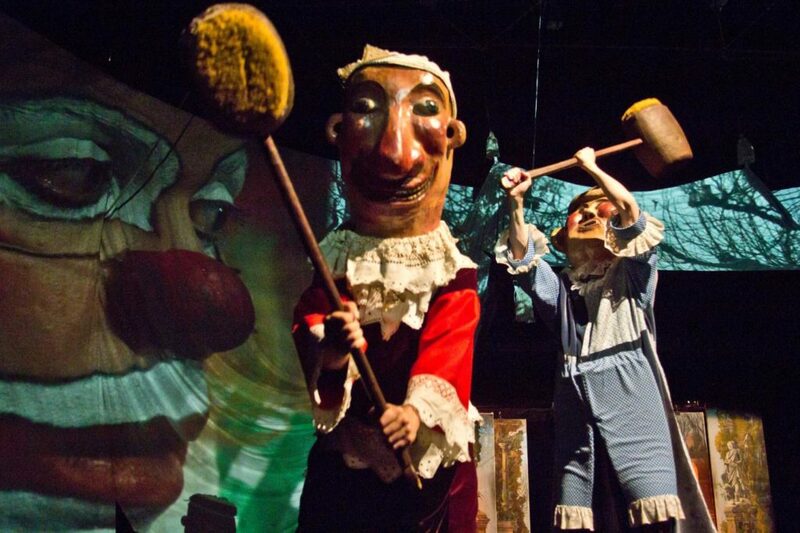 On the wandering again, the clowns make wooden puppets dance, but it is a macabre performance, ending with the puppets’ death at the hands of a puppet ghost. 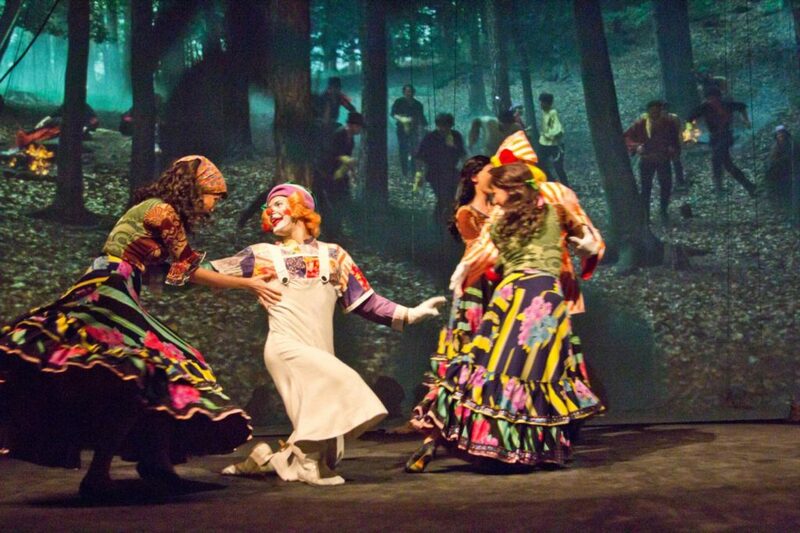 Shortly afterwards, the clowns get their comeuppance. They are beaten by a biker gang and return, wrecked, to the circus ring. Again, Venus enlivens their spirits and the voyage continues. 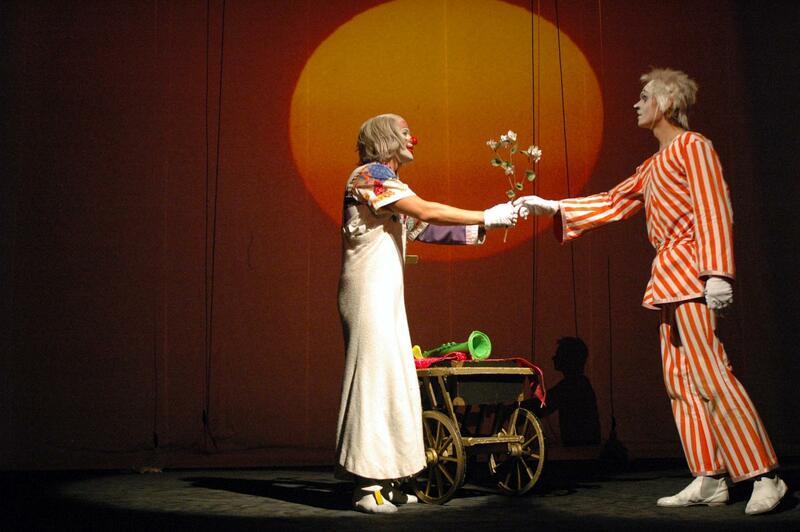 Clowns never surrender themselves to fate, but we have seen these two companions grow old. They come across a rundown circus caravan and plod away without noticing when the Venus comes out to greet them. Nostalgia blossoms when the clowns drop by a country wedding and sit among old peasants. One of the peasants holds a pink mallow blossom in his tired hands. Is the game over and the curtain closed for our clowns? No. They pull themselves together, return to the circus, and – once again – step into the ring.